1. What do you do, and how long have you been doing it? I am currently the Chair of the MFA Computer Art Department, Founding Chair of the BFA Computer Art Department and Director of Computer Education at the School of Visual Arts in New York City. I have been the MFA Chair for fifteen years, Director of Computer Education for twenty-one years and a faculty member for twenty-nine years. I am also an artist, musician, writer and curator. My first job out of graduate school in 1976 was as a Computer Animator for the Spectacolor billboard in Times Square, New York. We were best known for the New Year’s Eve count down and the computer animated opening for Saturday Night Live in the late 1970s. 3. Where did you complete your formal education? I received an M.S. degree in Television/Radio/Film from Syracuse University in 1976. It was there that I discovered computer graphics and one third of my credits were in Experimental Studios, which taught programming and computer graphics as artistic tools. 4. How did you first get involved with ACM SIGGRAPH? My first trip to a SIGGRAPH Conference was in Boston in 1989. I was on the Board of Directors of the New York Professional Chapter from 1990 – 2000. 5. 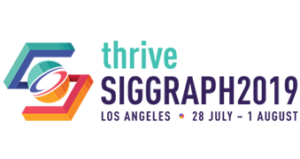 What is your favorite memory of a SIGGRAPH conference? This is a difficult question, as there are so many fond memories. I would pick being in the SIGGRAPH Art Show in 2003 as one of my favorite memories. 6. Describe a project that you would like to share with the ACM SIGGRAPH community. I would like to share an organization called the Seed Savers Exchange. Seed Savers Exchange members are participatory preservationists – small farmers and backyard gardeners that grow, save, and share seeds with others to keep our diverse garden heritage in the hands of many. They do this by maintaining thousands of plant varieties in one of the largest seed banks of its kind in North America, gathering valuable family and cultural information on rare varieties and documenting their histories, distributing heirloom varieties to members and the public through www.seedsavers.org. 7. If you could have dinner with one living or non-living person, who would it be and why? Thomas Edison. As the inventor of the light bulb, phonograph and motion picture, among many others, I was always fascinated by him. His New Jersey lab is in the town next to mine and I used to visit it frequently on school trips in elementary school and high school. I would love to gain some insight into how his mind worked. 8. What is something most people don’t know about you? I lead a fairly public life, so most people know about my love for music and motorcycles. What most people do not know is that gardening is one of my favorite hobbies. I have raised orchids, African violets, and since I live in New Jersey, delicious heirloom tomatoes. My record crop one year was 125 lbs., most of which I gave to my friends to enjoy. 9. From which single individual have you learned the most in your life? What did they teach you? I never had a single true mentor, so to speak. I learned from a lot of people. When I was young, I had an incessant desire to read and spent every Saturday morning at the local public library. What I learned from my readings and subsequent life experience from people is what to do and also what not to do. 10. Is there someone in particular who has influenced your decision to work with ACM SIGGRAPH? Dan Preda. Dan was a board member of the NYC Professional Chapter and my best friend for seven years until his untimely death in a motorcycle accident when we were on our way to SIGGRAPH in Orlando, Florida in 1994. He was a generous and caring individual, who was always willing to help other people, especially when it came to learning computer art. 11. What can you point to in your career as your proudest moment? The proudest moment of my career was when I was appointed Chair of the Computer Art Department at the School of Visual Arts in New York. I was the Founder of the department and four years later was promoted to Chair of the MFA Computer Art Department, where I have been for the past fifteen years.